The Széchenyi Hill Children's Railway, also known as number 4 Railway Line of the MÁV Zrt, (Magyar State Railways Ltd.), one of Budapest's transport attractions between II and XII districts. 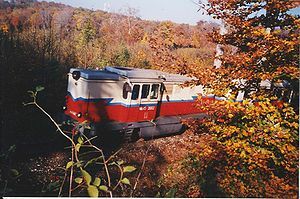 It runs between Hűvösvölgy és a Széchenyi Hill, for a 11.2 km distance, with 235 m incline, single track line with a speed limit of 20 km/h the trains and the journey takes about 40-45 minutes. Originally it was called the Úttörõvasút, ("Roadbuilder", the then regime's version of the 'Boyscouts'), today's official name MÁV Zrt. Széchenyi-hegyi Gyermekvasút, (MÁV Zrt. Széchenyi Hill Children's Railway). 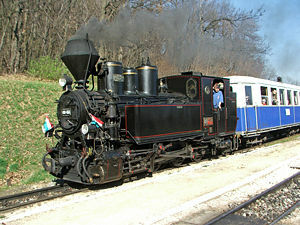 Small Railway's Day is the second Saturday in April. After considering other alternative sites, like Gödöllõ and Margaret Island the Magyar Kommunista Párt Központi Bizottsága (The Hungarian Communist Party Central Committee) finally chose the Buda Hills' site in February 1948. The narrow gauge (760 mm) small railway's building begin on the 11th April, 1948. Because of budgetary reasons, it was built in 3 parts. The works started at the Széchenyi Hill. The 'rush' built narrow-gauge (760 mm) railway was built by volunteers, university students etc. The young brigade's cut the forest trees down and laid the tracks. A book was written and published about the works' achievements etc. at the time. 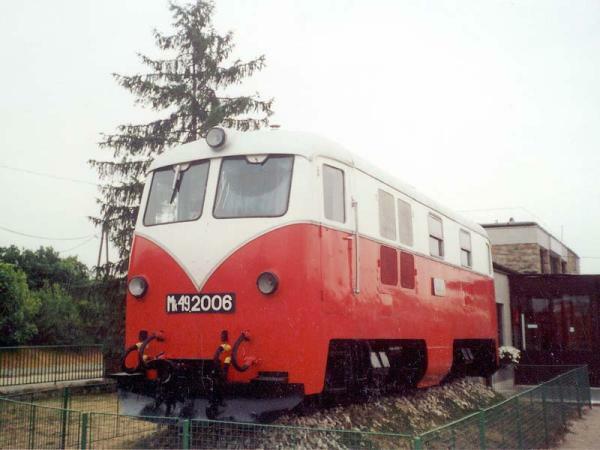 Parallel with the physical works the MÁV's, professional lecturers held regular classes for the first batch of girl and boy scouts to run the railway. Accordingly on the opening day the young staff was dressed in the proper railways' uniform to greet the public. A Children's Railways unit in coming. The first 3 km section was opened on the 31st July, 1948, to the then Elõre (Forward, the 'boyscouts' greeting and motto) station (Today's Virágvölgy - Flower Valley). 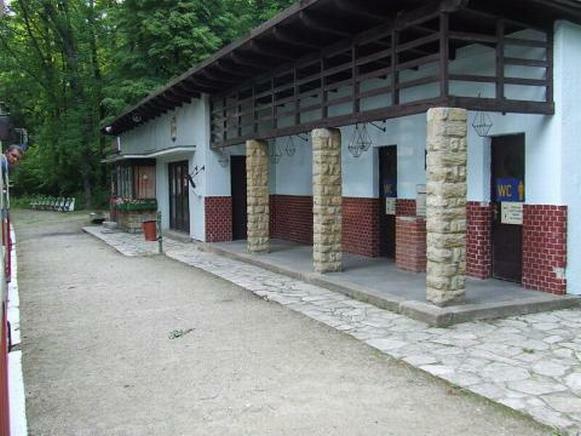 The Line was opened on the 24th June, 1949 to the Ságváriliget (Today's Szépjuhászné, Beautiful Shepherdess) Station. On the 20th of August 1950 (The communist regime's most important day, the Constitution Day - A day that was and is held very reverently in Hungary for probably a millennia, being Saint Stephen's Day, (Hungary's first King) and also was known as Harvest Day, being significant in agrarian cultures) the line was opened to the Hűvösvölgy Station. Hűvösvölgy railway yard etc. was opened in 1951. The Úttörővasút was the official communist, socialist ideology's educational tools for securing the upbringing of the younger generation for creative and productive work. As the regime had many real and imagined enemies, their kids would never qualify for acceptance. Only working class students with exceptionally good marks were excepted. For many years there were tenfold waiting lists. Acceptance at the Úttörővasút secured an guaranteed university entry. A nostalgic steam unit . 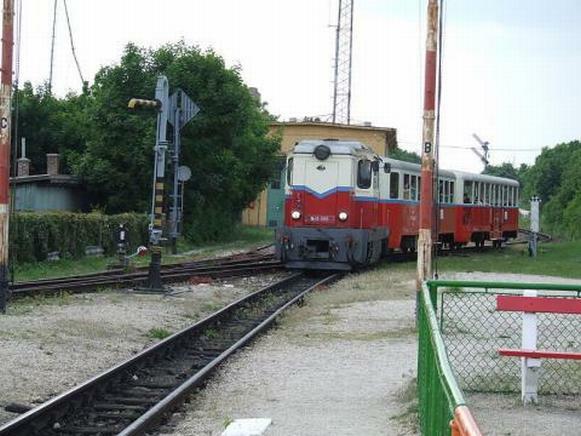 The duties on the railway are served by 10 to 14 year old students with adult supervision. The Station Master, locomotive, train drivers and technical staff are adult. The official objective was to train the future generation of railway staff as well. Originally (1950s, 1960s) the best students of 'standard schools' of Budapest had the opportunity after a successful study to qualify for acceptance. The duties were divided between 15 group, of one class students, who's duties were official non-attendance at classes and because of the grouping always missed different lectures. There were special group as well, such as choir, musicians etc. There were different arrangements over the years for turning up for duty, but normally they had to present themselves at 7 a.m. when they pick up their uniform, have their breakfast, daily briefing and flag raising ceremonies after which they were taken to their duty stations. After work, round about 5 p.m. these routines were reversed and finished with a dinner. The summer panoramic open coach . They wore different summer and winter uniforms and were issued with special tickets for the use on Budapest transport system. during the summer school holidays they had a special 2 weeks summer camp, during which they were organised into two groups for duty roster on the system. Some of the duties included ticket-inspector, secretarial duties, cashier, points switcher, souvenir sales and postal work. They were marked for their duties successful outcome as was appropriate by the Station Master or other superior adult in charge. For carrying out multiple task successfully they received appropriate plus marks for them. Some of their marks went towards their scholarly achievements. In the early years the communications between the station was by morse-code. About 45 minutes was the duration of the ride from one terminal to the other. A diesel unit in the 'bush' . The frequency of the service was dependent on the seasons, working day or weekend and the time of the day. The young staff had the opportunity to read their own newspapers, play board and other games in the quieter times. The meals were distributed from the trains at lunch time and other meal breaks. The railway had their own tickets and ticketing systems much the same than the ruling prices etc on the Budapest transport system or on the the MÁV, but slightly different design and colouring. Some stations didn't have a ticket office and if the traveler volunteered to buy a ticket, was charged the usual price otherwise had to pay the double price. Originally the Úttörővasút was built for propaganda purposes, but it wasn't more politicised then were other educational institutions of the day. The foundation of the railways was controversial at first, but in practice it taught the youngsters to work under minimal supervision with adults, customers as well with their younger counterparts, by communicating or handling money and other responsible duties. There are 7 stations and two Stops on the line. 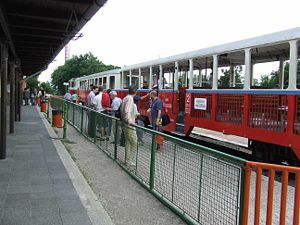 Many youngster working on the Úttörővasút found their career on the MÁV later. Annually, they have their Nostalgia Day ('Nosztalgianap'), when the ten or more years previous staff run the system. Over the years some of the Stops and Station were shifted, closed or new ones opened. 2 ABmot class motor coaches with 3 standard coaches, one postal and one lounge cars each. and numerous other rolling stock and maintenance vehicles. 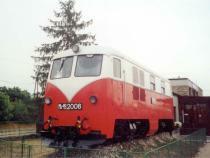 The railway can be easily reached from most parts of Budapest by public service buses, trams etc. There are numerous other attractions and sights around or near the stations. The above photos, courtesy Wikipedia, the free encyclopedia. Many thanks. Editor.